Order within 2 hours 52 minutes for Same Day Delivery! 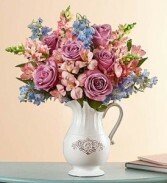 EXCLUSIVE For all she does, make this day one she’ll always remember with our gorgeous, garden-inspired arrangement. 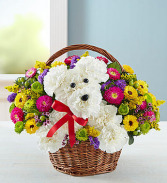 Here's a gift that has joy and cheer written all over it! 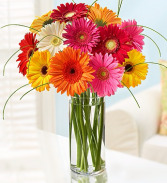 Our fresh Gerbera daisies, in vibrant assorted colors, are gathered together into a beautiful bouquet, so that you can deliver a big bunch of smiles for birthdays, anniversaries or "just because". 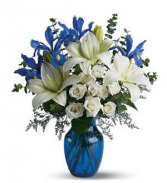 AN ELEGANT MIX OF IRIS'S, LILYS AND SPRAY ROSES AS A HEARTFELT EXPRESSION.